I have been laughing about the photo of that 1961 kitchen I ran yesterday. 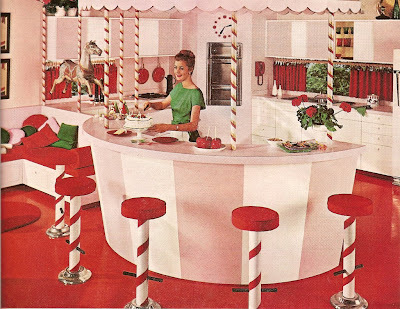 It's a peppermint carousel! It's a stripey fantasy! The model's outfit matches the throw pillows and the shrubbery outside! Man, this is precisely the sort of thing that keeps me from taking what I do too seriously. However, this is a pair of Levi's 501 jeans. 501s assumed their current form in 1960, a year earlier than the peppermint fantasy kitchen above. Granted, it took them another 20 years to get completely mainstreamed, but to men of my generation they were and are part of the uniform. Those same 501s remember the Beatles, watched Richard Nixon resign, got caught up in the Reagan revolution, followed the Grateful Dead around, showed up when casual Fridays became a substitute for a fringe benefit, counted down to the new millennium and cried when Barack Obama won an election. So sometimes, some things withstand the test of time and the winds of change. Who knows? Maybe a blue Dacor refrigerator is the new Levi's 501. I doubt it, but maybe.